While scientists have been diligently searching for other life-supporting planets, no habitable, life-supporting planet has yet been found. As it turns out, a planet must fit within very specific parameters to be capable of supporting life. This article identifies just four of the parameters a planet must fit within to be capable of supporting life — 1) the planet must reside in the just-right kind of galaxy, 2) the planet must be at a just-right location within the galaxy, 3) the planet must be located at a just-right position near two types of supernovae and 4) the planet must be located a just-right distance from the kind of star that produces certain elements needed to support life. The universe contains three basic types of galaxies: 1) spiral galaxies like the Milky Way Galaxy that Earth resides in, 2) elliptical galaxies and 3) irregular galaxies. Life cannot exist in an elliptical galaxy because stars stop forming in these kinds of galaxies before the galaxy is enriched with essential life-supporting heavy element materials (e.g., iron, nickel, copper, aluminum, etc.) Life cannot exist on planets in large irregular galaxies because large irregular galaxies have active nuclei which spew out toxic materials and radiation which are deadly to life. Planets located in small irregular galaxies cannot support life because the stars in those galaxies do not produce sufficient amounts of the heavy element material needed to support life. 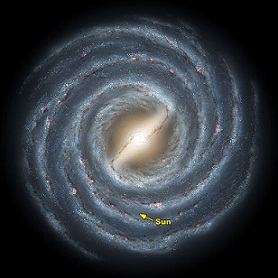 Indeed, in order for life to exist on a planet in a spiral galaxy, the parent star must be located between two spiral arms and the parent star must stay between the spiral arms without getting swept up into one of the adjacent spiral arms where there is too much star congestion. 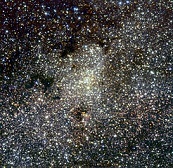 As it turns out, there is only a few such locations in a spiral galaxy which scientists refer to as co-rotation radii. Only .0001% (much less than 1%) of all stars in a spiral galaxy are located at co-rotation radii. As depicted in the illustration below, our star (the Sun) is located in this rare position. Because our sun is one of the rare stars located at a co-rotation radius, Earth is supplied with necessary life-essential elements and Earth’s orbit has remained stable such that Earth has not been subjected to deadly temperature variations, unstable atmospheres, high velocity winds or a variety of other problems associated with unstable orbits that would make life on Earth impossible for advanced life. A supernova is an explosion of a star which causes the materials produced by the star (e.g., iron, aluminum, silver, copper, oxygen, carbon, potassium, sulfur, nitrogen, etc.) to be expelled into space where the materials can be collected by nearby planets. Without a sufficient supply of these life essential elements, Earth would not be capable of supporting life. Type I supernovae give off one group of life essential elements and Type II supernovae produce a different group of life essential elements. In order for life to exist on a planet, all the life essential elements must be provided to the planet at the just-right time and in the just-right quantities. Scientists have determined Earth has been provided with just the right quantities of the heavy elements needed to support life because a Type I supernova and a Type II supernova occurred at the just right time (i.e., when the Sun’s solar nebula was formed). 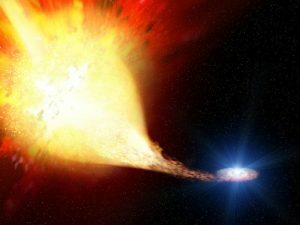 However, once life began existing on Planet Earth, it was necessary for the number of supernovae occurring close enough to affect life on Earth to dramatically decrease; otherwise, life on the planet would be exterminated by the deadly radiation expelled from supernovae explosions. Even if a star (like the Sun) resides at a just-right location at a just-right time for planets orbiting the star to get the just-right amounts of life essential elements from a Type I supernova and a Type II supernova, there is still one necessary heavy element a life-supporting planet must have that it cannot get from supernovae, namely, fluorine. Without fluorine, certain proteins necessary for life could not form. 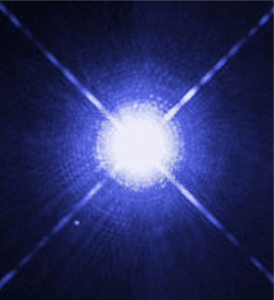 The larger star must also be close enough to the white dwarf so that when the star loses the material needed to manufacture fluorine on the white dwarf, the material will gravitate to (and be collected by) the white dwarf. Finally, after fluorine is manufactured on the surface of the white dwarf, the fluorine must then be expelled from the white dwarf into interstellar space so it may be collected and retained by the life-supporting planet. As referenced in this article and other articles on this website, the exquisite precision and chance calculations involved with all of the numerous finely-tuned design features necessary for life to exist in the universe are astronomical — numbers like 1060 (the mass density of the universe here >>), 10100 (the weak nuclear force here >>), and 10120 (the energy density of the universe here >>). The incomprehensibility of this kind of fine-tuning is more fully appreciated when one considers that there are only about 1025 grains of sand on all the beaches on Planet Earth. This means that fine-tuning in the order of 1060 is like saying not a single grain of sand could be added to or removed from one beach on Planet Earth without causing the entire planet to be incapable of supporting life. Indeed, this illustration is tremendously understated because it assumes a change in one part in about 1025 (the estimated number of grains of sand on Earth) whereas the total mass density of the universe must be fined-tuned to within one part in 1060 and dark energy must be fined tuned to 10120, which are substantially greater numbers than 1025. When one looks at the probability calculations for life to have developed by chance, the numbers are even more incomprehensible. For example, just the chance of amino acids randomly coming together to form the 2,000 enzymes which are essential for life to exist has been calculated as only one chance in 1040,000 here >>.